WASHINGTON, D.C. — As Americans head to church this Sunday morning, hundreds of pastors from 40 states are urging President Trump to preserve Deferred Action for Childhood Arrivals (DACA) and work with Congress to pass bipartisan legislation to protect Dreamers. More than 300 pastors and evangelical leaders have signed on to the letters to the president, House Speaker Paul Ryan (R-Wisconsin) and Senate Majority Leader Mitch McConnell (R-Kentucky) that leaders of the Evangelical Immigration Table released late last week. Jason Lee, Baptist Minister and Director of the Acts 17 Initiative, Atlanta:“As a Bible-believing Christian who seeks to obey the call of Christ to love my neighbor, to do justice and love mercy, and stand for the vulnerable, it is clear to me that we must find a way to protect our Dreamer neighbors and find a workable solution so that they may stay in the U.S. The nation’s foreign-born population is projected to reach 78 million by 2060, making up 18.8% of the total U.S. population, according to new Census Bureau population projections. That would be a new record for the foreign-born share, with the bureau projecting that the previous record high of 14.8% in 1890 will be passed as soon as 2025. 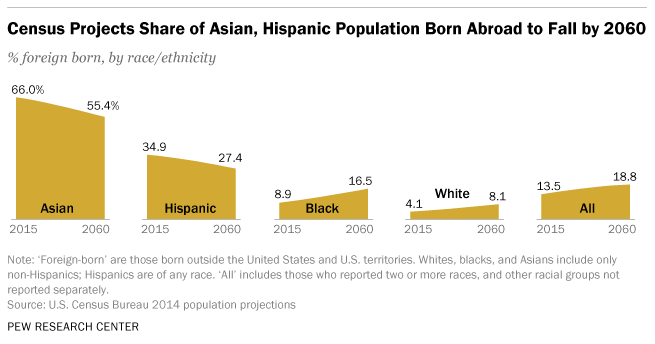 Yet while Asian and Hispanic immigrants are projected to continue to be the main sources of U.S. immigrant population growth, the new projections show that the share of the foreign born is expected to fall among these two groups. Today, 66.0% of U.S. Asians are immigrants, but that share is predicted to fall to 55.4% by 2060. And while about a third of U.S. Hispanics (34.9%) are now foreign-born, the Census Bureau projects that this share too will fall, to 27.4% in 2060. These declines are due to the growing importance of births as drivers of each group’s population growth. Already, for Hispanics, U.S. births drive 78% of population growth. Meanwhile, foreign-born shares among whites and blacks are expected to rise. Today, 8.9% of those who identify as black were born in another country, but that number is projected to almost double – to 16.5% – by 2060. Among whites, 4.1% are foreign-born today, but that share is projected to double to 8.1% in 2060. The U.S. today has more immigrants than any other nation. As the nation’s immigrant population grows, so too will the number of children who have at least one immigrant parent. As of 2012, these second generation Americans made up 11.5% of the population, and that share is expected to rise to 18.4% by 2050, according to Pew Research Center projections. This is the first time in 14 years the Census Bureau has made projections of the foreign-born population. Predicting future immigration and birth trends is a tricky process, and the bureau has substantially changed its projections from year to year in light of reduced immigration and birth rates. Census Bureau developed the Supplemental Poverty Measure to get a more comprehensive appraisal of family income and expenses. 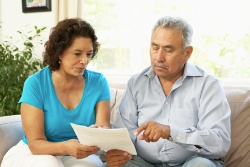 WASHINGTON D.C. -- The majority of elderly blacks and Hispanics are economically vulnerable, at 63.5 percent and 70.1, respectively, a new Economic Policy Institute briefing paper finds. In Financial security of elderly Americans at risk: Proposed changes to Social Security and Medicare could make the majority of seniors ‘economically vulnerable,’ Elise Gould, EPI director of health policy research, and David Cooper, EPI economic analyst, explain that because official poverty statistics do not account for seniors’ increased health costs, they mask the true vulnerability of the elderly population. Using a more comprehensive assessment of seniors’ living expenses, they find that nearly half of America’s seniors, especially minorities and women, are just one bad economic shock away from falling into poverty. As such, any proposed changes to Social Security and Medicare must be evaluated not just for their impact on future budget deficits, but for their impact on living standards of the elderly. 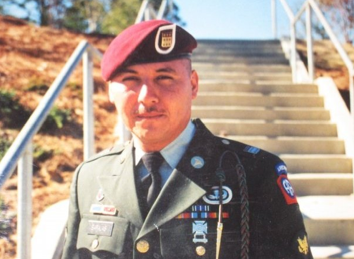 Hector Barajas, US Army 82nd Airborne Spc. time and proudly served from November 1995 to November 2001. During his service, he received two honorable discharges and two AAM´s (Army Achievement Medal), a Good Conduct Medal, a National Defense Army Service Medal and Humanitarian Medal. He proudly served with the 407th Golden Griffins C Co, ·307th FSB Renegades C Co., WBAMC. Shortly after his discharge from the military he got in trouble with the law, served time, but during his incarceration he received multiple diplomas and most of all, a rehabilitation. Upon his release Hector had an immigration hold, a legal process to deport him. He could not believe the country he had proudly served would turn his back on him. In a very short time, Hector was chained and flown to Arizona by the US Marshals, without any legal help and no one to turn to. During his quick hearing, Hector represented himself to no avail. He was deported in 2003 to a land he didn't know, speaking a language he felt was foreign. For six months Hector appealed his case, arguing he was a US National and that he could not be deported because of his military oath and permanent allegiance to the United States. The judge thanked Hector for his service, explained that if the country was in conflict status or if Hector was a combat veteran, things would be different, but that was not the case and ordered him to be deported. Today, Hector writes about his life in a foreign land on his facebook page and shares his torment and tears of missing his daughter and his country. Regardless of status, many US military veterans, including combat veterans, are facing what Hector Barajas has been fighting over the last decade, the unjust deportation of someone who was willing to make the ultimate sacrifice for his country. To many veterans, the US government denies their claims of being a National or an American, even though they have proudly worn a uniform of the United States military. Today, Hector knows that while he served in the military, there was never a distinction of where he was born and where his heart was at. He still believes in this country and proudly states he is a US Veteran. No matter where he goes he shares "I will always be a United States Veteran." Mexican origin Hispanics account for 64% of Latinos in U.S.
WASHINGTON D.C. -- A record 33.7 million Hispanics of Mexican origin resided in the United States in 2012, according to a new analysis of Census Bureau data by the Pew Research Center. This estimate includes 11.4 million immigrants born in Mexico and 22.3 million born in the U.S. who self-identify as Hispanics of Mexican origin. Mexicans are by far the largest Hispanic-origin population in the U.S., accounting for nearly two-thirds (64%) of the U.S. Hispanic population in 2012. Hispanics of Mexican origin are also a significant portion of the U.S. population, accounting for 11% overall. The size of the Mexican-origin population in the U.S. has risen dramatically over the past four decades as a result of one of the largest mass migrations in modern history. In 1970, fewer than one million Mexican immigrants lived in the U.S. By 2007 it reached a peak of 12.5 million. Since then, it has declined as the arrival of new Mexican immigrants has slowed significantly. Today, 35% of Hispanics of Mexican origin were born in Mexico. And while the remaining two-thirds (65%) were born in the U.S., 52% of them have at least one immigrant parent. Before the 1980s, growth in the nation's Mexican-origin population came mostly from Hispanics of Mexican origin born in the U.S. However, from 1980 to 2000, more growth in the Mexican-origin population in the U.S. could be attributed to the arrival of Mexican immigrants. That pattern reversed from 2000 to 2010 as births surpassed immigration as the main driver of population growth. The 11.4 million Mexican immigrants who live in the U.S. make up the single largest country of origin group by far among the nation's 40 million immigrants. The next largest foreign-born population group, from greater China at 2 million, is less than one-fifth the size of the Mexican-born population in the U.S.
Mexican immigrants comprise by far the largest share of the unauthorized immigrant population in the U.S. More than half (55%) of the 11.1 million immigrants who are in the country illegally are from Mexico. Internationally, the U.S. is far and away the top destination for immigrants from Mexico. Fully 96% of Mexicans who leave Mexico migrate to the U.S. Worldwide, nine percent of people born in Mexico live in the U.S. In addition, the U.S. has more immigrants from Mexico alone than any other country has immigrants. The characteristics of Mexican immigrants living in the U.S. have changed over the decades. Compared with 1990, Mexican immigrants in 2011 were less likely to be male, considerably older, better educated and have been in the U.S. for longer. 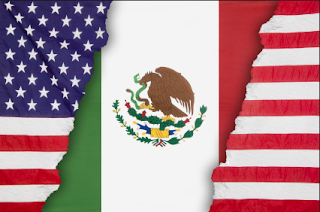 This report includes demographic, income and economic characteristics of the foreign-born and native-born Mexican-origin populations in the U.S. and compares them with the characteristics of all Hispanics. It covers immigration status, language, age, marital status, fertility, regional dispersion, educational attainment, income, poverty status, health insurance and homeownership. The report, "A Demographic Portrait of Mexican-Origin Hispanics in the United States," was written by Ana Gonzalez-Barrera, research associate with the Pew Hispanic Center, and Mark Hugo Lopez, associate director of the Pew Hispanic Center. It is available at the Pew Research Center's website, www.pewresearch.org. Pew Research Center is a nonpartisan source of data and analysis. It does not take advocacy positions. Its Hispanic Center, founded in 2001, seeks to improve understanding of the U.S. Hispanic population and to chronicle Latinos' growing impact on the nation. 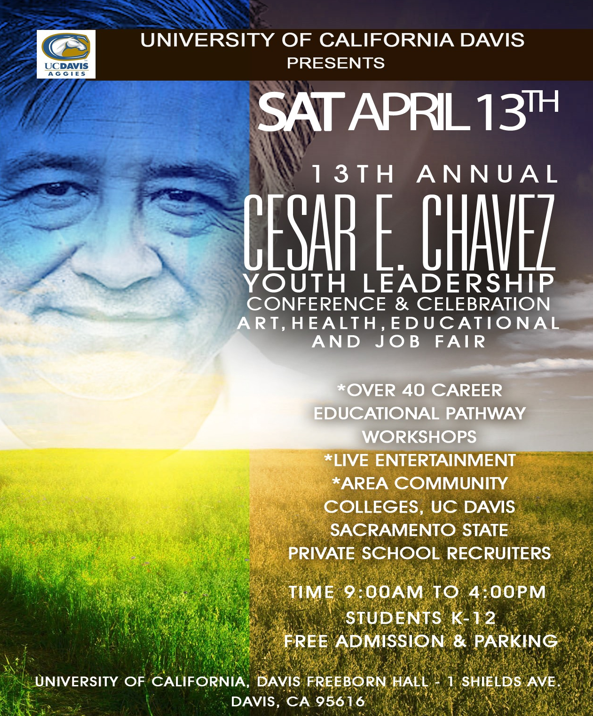 DAVIS, CA – Close to 500 elementary, middle and high school students will converge on the Cesar E. Chavez Youth Leadership Conference on Saturday, April 13, 2013 in Freeborn Hall at University of California, Davis in Davis, California. The conference will include an Arts, Education, Health and Job Fair. For over a decade, this event has provided guidance to youth seeking to pursue higher education and grant information. This unique educational forum allows 6th to 12th grade students and their parents an opportunity to learn how to pursue secondary educational and grant opportunities. College recruiters will be available to answer student questions. There will also be information designed to empower families to become stronger advocates for their children's education. The conference is open to people of all ages. It is scheduled from 9:00 am to 4:00 pm at the UC Davis – Freeborn Hall located at 1 Shields Ave, Davis, CA 95616. Approximately 700 students and 200 parents attended the 2012 conference. The event kicks off with registration and a chorizo burrito breakfast, pan dulce and hot chocolate. From 12:30 pm to 2:55 pm, there will be a special program, “Embrace the Legacy of Cesar Chavez” lunchtime celebration and talent show. Performers include folkloric dancers, Aztec dancers, and trick roping cowboy and whip master James Barrera. There will also be carnita and vegetarian burritos for conference attendees to feast upon. There will also be a live theater presentation, "Nightmare on Puberty St." by the Kaiser Educational Theater Program. That presentation begins at 9:30 am. The conference traditionally kicks off a series of Sacramento-area events related to California’s Cesar Chavez Holiday. Cesar Chavez was co-founder and president of the United Farm Workers (UFW) union. He led the union from the 1960s to his death at age 66 in 1993. The UFW was instrumental in organizing farm workers in several states. In 2000, Governor Gray Davis signed SB 984, asking that school districts give an hour of instruction in all schools around Chavez's March 31 birthday. The youth conference continues to recognize the UFW founder's lessons on non-violence, self-sacrifice and social justice. Students are encouraged to engage in some form of public service appropriate for their age and grade as part of the Cesar Chavez Day of Service of Learning. Hosts include: the University of California, Davis; the Hispanic Empowerment Association of Roseville; and the California Latino School Boards Association. 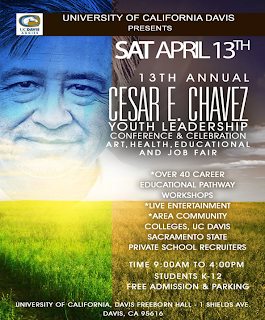 For more information on the Cesar Chavez Youth Leadership Conference, call Rene Aguilera at (916) 532-5998, or fax registration applications to H.E.A.R. at (916) 782-2040. Or students can take their completed application to their counselor and ask them to fax it. Visit the conference web site at www.hear2000.org.